Get ready for a hilarious fun-filled adventure starring Chloe (voiced by Drew Barrymore), a diamond-clad ultra-pampered Beverly Hills Chihuahua who gets lost while on vacation in Mexico. Papi (voiced by George Lopez), an amusing Chihuahua who's crazy about Chloe, springs into action and heads south of the border to rescue her, while Chloe gets help from Delgado (voiced by Andy Garcia), her newfound friend and self-appointed protector. Beverly Hills Chihuahua from Walt Disney Pictures is a heartwarming and outrageously funny tale proving once again that good things do come in small packages. It's a real treat for the whole family. $29.300 million on 3215 screens. Never underestimate the appeal of talking animals. In the category of unexpected box office success, we find 2008’s Beverly Hills Chihuahua. The movie featured no big names and went with a modest premise but scored pretty nicely with a gross of $94 million. So expect a Beverly Hills Chihuahua In Space or something like that soon – there’s no way Disney won’t milk the burgeoning franchise for all it’s worth! 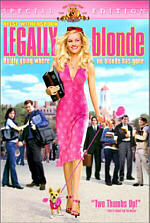 In this flick, we meet Chloe (voiced by Drew Barrymore), the Chihuahua owned by cosmetics tycoon Viv (Jamie Lee Curtis). When Viv needs to leave on a last-minute overseas business trip, she needs emergency supervision for Chloe. Out of desperation, she recruits her flaky niece Rachel (Piper Perabo) to care for her beloved pooch. All goes well at first until Rachel and her friends take a road trip to Mexico. Chloe scampers out of the hotel room and promptly gets abducted by a dog-fighting ring. She nearly meets her demise at the jaws of a monstrous canine named El Diablo (Edward James Olmos), but a courageous German Shepherd named Delgado (Andy Garcia) rescues her. This sets an adventure into motion, as Delgado grudgingly tries to guide Chloe back to her owner. In the mean time, Rachel attempts to locate the lost pup, and the leaders of the dog-fighting group try to track Chloe. Why? Because as she escaped, they noticed her diamond necklace, so now they want to hold her for ransom. Frequent readers will probably be aware of my intense fondness for dogs. I love animals in general, but I’m a sucker for canines – especially the little ones. As the proud long-time parent of toy poodles, I just adore small dogs. All dogs are great, but the tiny ones are the best! So if even I can’t find much charm in Hills, that means there’s something wrong. Oh, I won’t say that it’s a bad movie, as it remains reasonably watchable. My biggest complaint comes related to the dog-fighting sequence, as the film gives that segment too much of a comedic tone. There’s nothing remotely funny about dog-fighting, and that subject shouldn’t be treated in such a light manner. Otherwise, this is perfectly mediocre material. Granted, I recognize that I’m not in the film’s target audience. The flick aims at a pre-teen crowd; my love for dogs makes me a little more open to its charms, but I remain far outside of the targeted element. Just because a movie shoots for a kiddie crowd doesn’t mean it can’t entertain adults, though. Unfortunately, Hills just doesn’t have much going for it in that regard. Its canine cast offers virtually all of its charms. We find an abundance of sweet pups on display here, and they prove consistently adorable and lovable. No, they’re not as sweet as my dogs, of course, but they add charm to the film. Speaking of my pooches, they enjoyed Hills. Biscuits remained glued to the screen, as she was clearly fascinated by all the canine sights and sounds. We certainly find plenty of yips and yaps, so Bisc found a lot to love. As for me, I couldn’t locate much to enthrall me. Hills provides relentlessly average “family” entertainment. It follows a mix of predictable story lines along with tired jokes and not much inspiration. The dogs are cute enough to make it watchable, but that’s the best I can say for it. 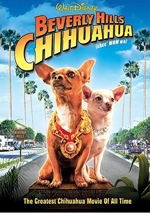 Beverly Hills Chihuahua appears in an aspect ratio of approximately 2.40:1 and in a fullscreen version on this single-sided, double-layered DVD; the former has been enhanced for 16X9 televisions. Only the widescreen edition was examined for this review. While the film often looked pretty good, some drawbacks made it less than spectacular. Sharpness became the main problem area. Close-ups and medium shots seemed fine, but wider elements tended to appear moderately soft. None of these sequences were horribly ill-defined, but they seemed less concise than I’d expect. No issues with jaggies or shimmering materialized, but I noticed a little edge enhancement. At least I saw no source flaws, as the movie consistently seemed clean and smooth. With a wide palette, colors became a strength. The movie featured a broad variety of hues and the movie replicated them in a lively manner. Blacks were dark and firm, while shadows looked clear and concise. Much of the flick seemed well-reproduced, but the problems with softness left it as a “B-“ transfer. The Dolby Digital 5.1 soundtrack of Hills seemed solid for this sort of movie. Although the soundfield displayed a fairly strong orientation toward the forward channels, it broadened nicely when necessary. For the most part, the track concentrated on good stereo imaging for the music as well as ambient effects. The soundfield wasn’t wildly active, but it broadened the audio well, especially during Chloe’s attempts to get home; those sequences featured chases, trains and other action elements, so they brought out some good material. Sound quality seemed decent. Speech was natural and distinctive, with no issues connected to edginess or intelligibility. Effects were concise and accurate and showed positive low-end at times. Music sounded good as well, with nice range and clarity. At no point did the mix excel, but it satisfied. When we move to the extras, we open with an audio commentary from director Raja Gosnell. He offers a running, screen-specific chat that looks at cast and performances, sets and locations, visual and production design, working with the dogs, visual effects, and musical choices. Gosnell offers a good examination of the film. He keeps matters light as he digs into the various aspects of the production. The chat proves enjoyable and provides a more than competent look at the flick. A cartoon called Legend of the Chihuahua runs three minutes, eight seconds. The animated short gives us a quick and semi-irreverent history of the Chihuahua. It’s cute and mildly informative. Three Deleted Scenes fill a total of 10 minutes, 10 seconds. (That includes introductions from Gosnell.) We find “Chihuahua Nation” (2:04), “Chloe’s Vision Quest” (5:16) and “Mi Corazon: Chloe and Papi’s Duet” (0:37). Of the three, “Quest” is the most interesting, as it gives us a substantial look at Chloe’s transformation. The other two are less interesting. Gosnell’s intros simply set up the clips; he doesn’t tell us why the scenes were changed or cut. Blooper Scooper runs three minutes, eight seconds. Some of the bits provide the usual goofs, but we also get outtakes of the dogs. I like those elements, as they let us learn a little more about how the filmmakers got the pooches to act. A few ads open the DVD. We get promos for Blu-Ray Discs, Pinocchio, Up, Bedtime Stories, Air Bud and Disney Movie Rewards. These also appear under Sneak Peeks along with a clip for Disney XD. The trailer for Chihuahua appears here only as an Easter egg. If you go to the “Special Features” page, click down from the “Audio Commentary” option and you’ll highlight a paw print. Hit “enter” and you’ll find the movie’s trailer. With a broad collection of adorable pups, Beverly Hills Chihuahua occasionally delights the dog-lover in me. However, even as sweet as these pooches are, they’re not enough to make this flick anything more than mediocre family entertainment. The DVD offers erratic but usually good picture as well as fine sound and some extras led by a good audio commentary. Hills doesn’t become a painful viewing experience, but it lacks much to make it memorable.